Tibetan rosaries (malas) are traditionally used for a special Buddhist practice. Tibetan Buddhism suggests that there are 108 negative emotions to overcome. 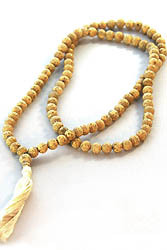 Lotus Seed malas are strung with 108 beads in order to say a mantra for each one. The bead size of this Lotus Seed Mala typically ranges from 7 to 9 mm diameter, and has 108 beads. Hand-strung in Dharamsala on a durable nylon coated wire and finished with a cotton tassel. These are fair-traded and sales from these malas go directly to the Buddhist communities who make them. They cost a little more, but they are authentic items imported directly from Nepal. Rudraksha beads are actually seeds. They are obtained from trees yielding beautiful blue berries, the best of which come from Nepal and Indonesia.. As many of you know well, Shiva devotees especially treasure these interesting beads. There are mythological associations having to do with the fact that "Rudra" is another epithet for Shiva, and "aksha" is a Sanskrit word that means, eyes. Hence the meaning eyes or tears of Shiva. The beads are sacred to Shaivites (those who worship God in the form of Shiva), and are felt to be capable of conveying the blessings of Shiva. Rudraksha, as mentioned is a seed. Each seed has naturally formed sections called "faces" or "mukha" in Sanskrit. The most common form of rudrashka is the 5-face bead. This one is considered beneficial to ones spiritual progress - it sustains one on the path to liberation.